Widely considered Bangkok’s finest French restaurant, Le Beaulieu serves dishes that would be at home in Paris. It also charges prices that are simply beyond my budget. 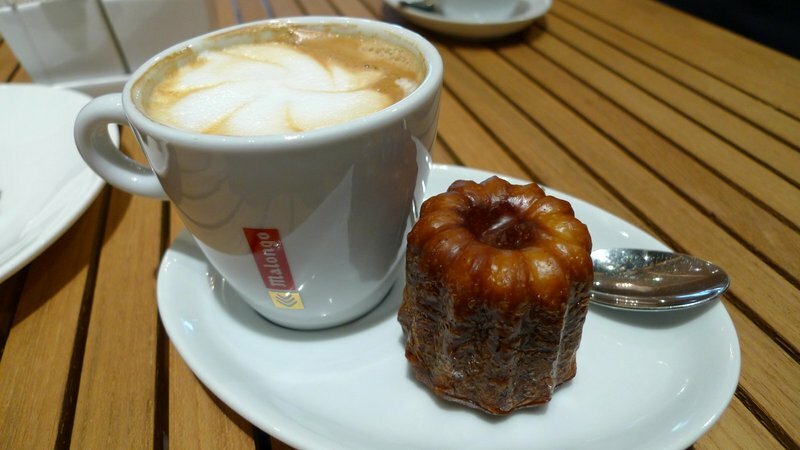 But when I want un petit goût of that French sophistication without landing in the poorhouse, I stop by the Le Beaulieu cafe and purchase a few cannelés. Cannelés, a pastry from Bordeaux with a dark, richly caramelized crust and a soft, almost custardy center, are painstaking to make. They require copper molds that are lined with beeswax and butter before being filled with a crêpe-like batter that has rested up to 48 hours. The two-step baking process begins with an extremely hot oven that is later lowered to a more reasonable temperature in order to produce the distinctive crust. Done right, the results are heavenly. Done wrong, they resemble either a burned brick or an eggy sponge. The cannelés at Le Beaulieu have the ideal texture, the right amount of caramelization on the exterior that makes for a complex flavor without tasting burnt. Served with a tasty espresso drink from Malongo, a family-owned coffee firm from Nice, I can afford to have that French cafe experience without having to survive on crumbs alone. This entry was posted in Uncategorized and tagged bakery, baking, canele, cannele, dessert, food, French, lebeaulieu, pastry by christao408. Bookmark the permalink. I need that in my mouth now. Lovely with some nice afternoon tea! Now that not only looks yummy but is also lovely to look at. agreed with @Grannys_Place – , you could probably make a meal from McDonald’s look amazing 🙂 thank you for sharing your experience though. that food looks yummy! The dessert looks yummy. Maybe one day, you can afford the entree’…..
hmm… sounds like a challenge! i’m game to try making some, although i guess i would need the right kind of pan. Beeswax? That sounds intriguing. I’m going to see where I can buy this here. Must be divine. Can’t help but wonder how much damage it does to the wallet. I am sure you can give it a try, and make it just perfect. Looks yummy. @RushmoreJ – @Grannys_Place – Thanks for the recommendations. @ZSA_MD – @kunhuo42 – Getting the correct tins is the problem. The authentic copper ones are about $20 per mold (individual, not a set of 6 or 12!) which is crazy. The silicone molds don’t do as well, from what I’ve read, because you don’t get as nice a caramelization to the crust. Haven’t decided if this is a dish that’s worth the effort to try baking…@Inciteful – They aren’t cheap – about $2 per cake. One of those very special occasion treats. @ElusiveWords – Am sure there are many places selling them in Toronto. @armnatmom – Actually, I went there with friends, unaware of the prices. Ended up having to take a deep breath and plunge in, trying to be as frugal as I could. @rudyhou – “IF” you come back to Bangkok? I thought that was “when”! =D@l0311879l – It’s all in the lighting, right? Ha ha…@Fatcat723 – Yes, but it would need to be a stronger tea, I think. These are pretty rich cakes so the beverage needs to be able to cut through the richness. @Erika_Steele – Quick! Cannelles run! @murisopsis – @CurryPuffy – They really are very pretty, aren’t they? i want some throw it over the back fence ok? It looks really pretty – thought it was two walnuts stuck together. 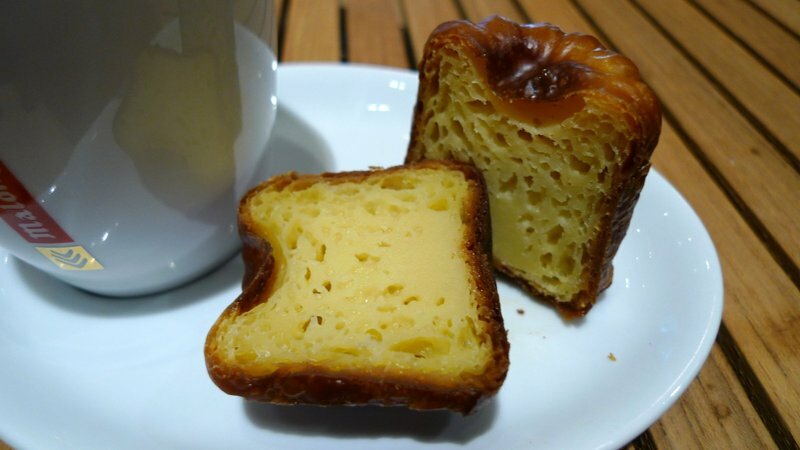 I like your attention to detail in your posts – I pretty much ate this canneles as I read your post.